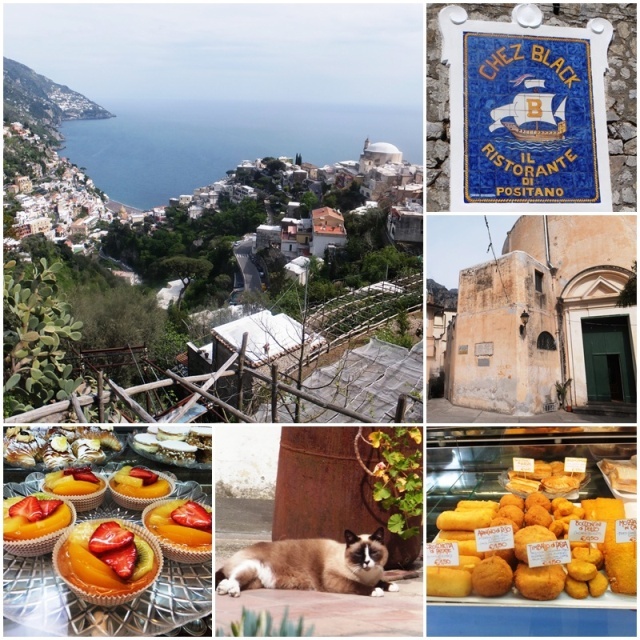 After my first full day in Sorrento I decided to visit Positano on April 23, 2013. Although the town is officially less than 20 km from Sorrento, it takes almost an hour to get there (in good traffic) because of the many switchbacks and tight curves on the narrow road. As I had seen before, the buses on the Amalfi Coast filled up very quickly and a few minutes before departure it was standing room only. 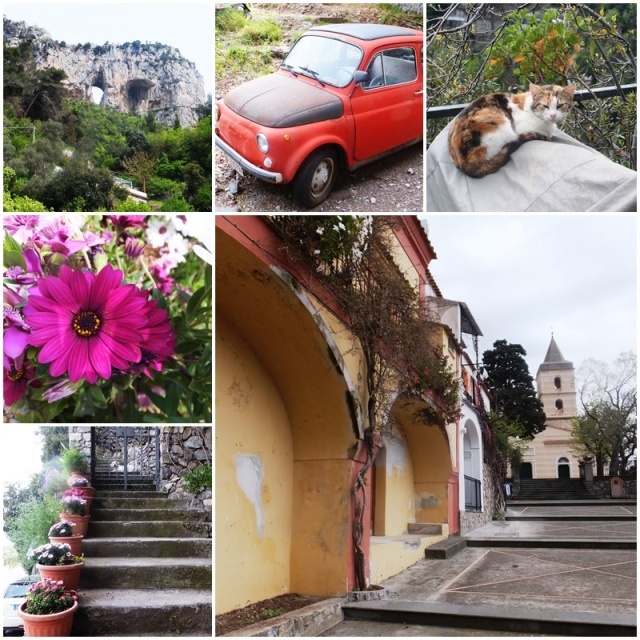 We started rolling through the Sorrento Peninsula through mountain villages like Massa Lubrense and Sant’Agata. Then we crossed the crest of the mountains and saw the Mediterranean shores on the south side of the Sorrento Peninsula coming into view. 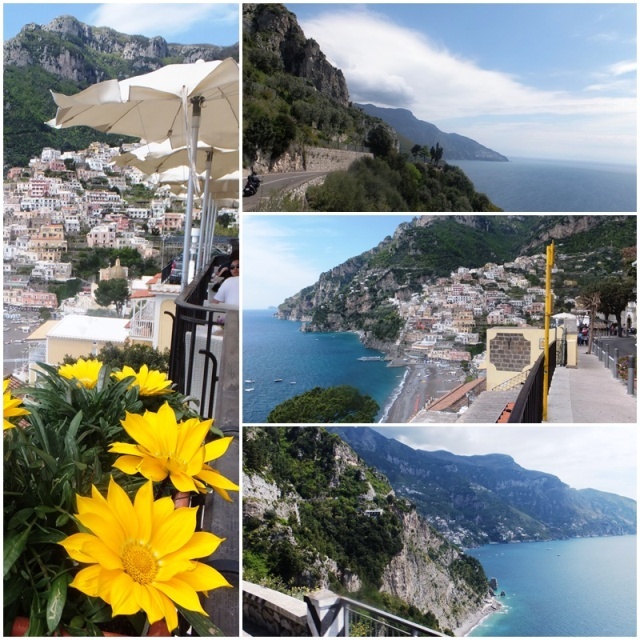 The panoramas along the Amalfi coastline are absolutely phenomenal. Shortly after noon I arrived in the renowned coastal town of Positano. This small town of about 4,000 people flourished during the 16th and 17the centuries, but experienced a severe decline in the mid 19th century which forced many residents to emigrate. Almost half the population emigrated and the vast majority of them ended up settling in Australia. Even during the early 20th century, Positano was just a poor fishing village until it was discovered by John Steinbeck in the 1950s which triggered an influx in tourists. Together with the town of Amalfi, Positano is the most popular destination along the incredibly picturesque Amalfi Coast. Positano stretches upwards along the flanks of the Lattari Mountains that form the spine of the Sorrento Peninsula. White, light pink and orange houses stretch up along the mountainside. From the bus station, which is located part-way up the mountain, I decided to walk downhill into the lower part of town by the water. 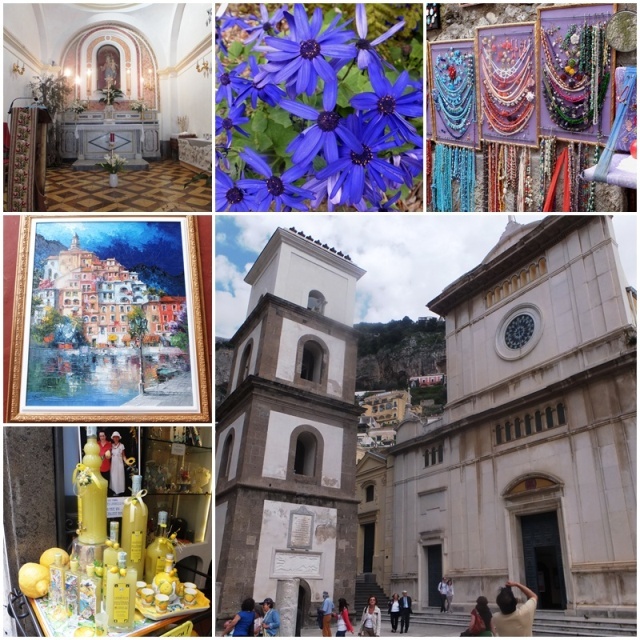 I passed many souvenir shops, boutiques, bars and restaurants until I arrived at the famous church of Positano, la Collegiata di Santa Maria Assunta. It has a beautiful roof that is covered with colourful majolica tiles. The church was built surprisingly recently in the 1920s, but its most famous treasure is a Byzantine icon called the Black Madonna that dates back to the 13th century. To my chagrin, the doors were locked, so I had to get an interior shot of the church through the glass. After a leisurely stroll through town I decided to take a local bus up to the village of Nocelle. 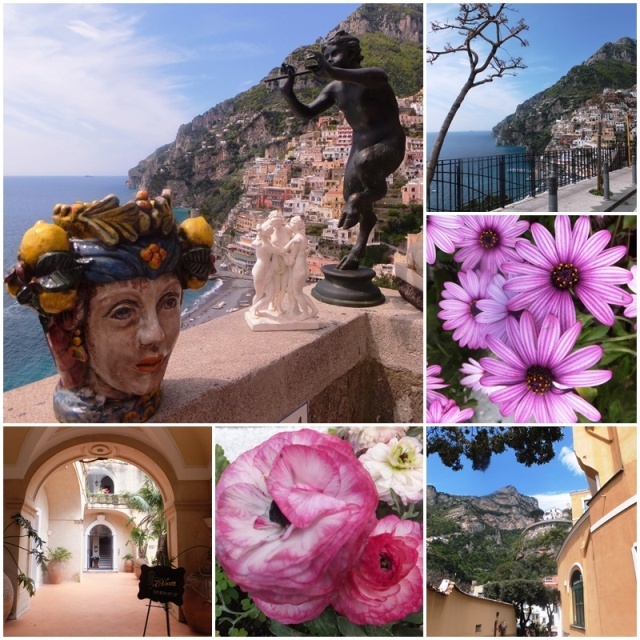 I always love to explore the hinterland of really busy and popular destinations, just to get a more authentic feel of the towns along the Amalfi Coast without all the touristic hustle and bustle. Nocelle is a small mountain village that provides absolutely stunning vistas of the coastline. In the past it was a strategic lookout point to keep a watchful eye out for pirates. From what I had read, Nocelle offers access points to a famous hiking trail, the “Sentiero degli Dei” – the “Path of the Gods”, an unbelievably scenic hiking path. 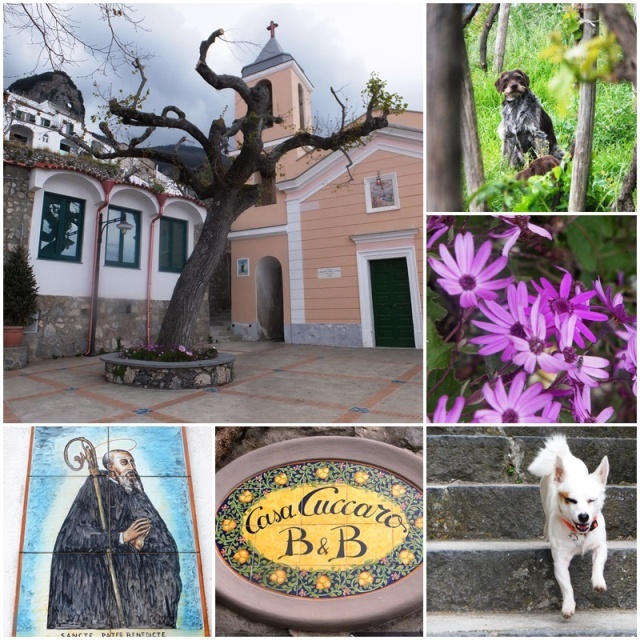 I wanted to get on that path but could not find proper signage to find an entrance point, so I contented myself with a short stroll, or rather a short up-and-down climb on the steep steps of this mountain village. Nocelle is very small, but it features several bed and breakfasts and a couple of restaurants. From Nocelle I decided to hike back down to the coast and stopped in Montepertuso, a pretty village up on the flanks of the Lattari mountains. The Sorrento Peninsula is a fabulous destination for hiking and trekking, and Montepertuso is famous for a large hole inside a prominent rock formation that protrudes above the coastline. This natural arch forms part of the Path of the Gods. Most of the trails along these mountains were originally made by farmers and their mules as walking was the only way to get back and forth along the Amalfi Coast before the coastal road was built in the early 20th century. Before the advent of modern infrastructure, life for the local farmers here must have been very hard and cumbersome. At the end of my walk I arrived back in the higher part of Positano. I visited the Chiesa Nuova, the new church of Positano, at the top of the village. Then, since I was really hungry now, I entered a local bar and purchased an “arancino”, a fried ball of rice with a tasty filling, a typical Southern Italian specialty. It turned out to be a great quick and delicious snack. After that it was back on the bus to Sorrento where I had to stand right in the front with the driver since the bus was completely packed. This gave me a great full frontal view of the winding road that snakes along the Amalfi Road and I thoroughly enjoyed the ride. 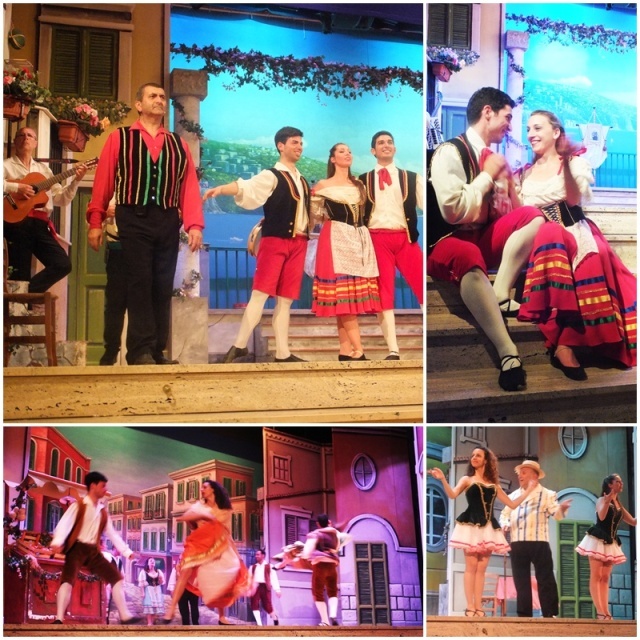 Back in Sorrento, I attended an evening performance of the Sorrento Musical Show in the historic Teatro Tasso: this spirited performance takes its cue from the Southern Italian “Tarantella” dance. The singing and the music were absolutely lovely, and the dancers even came into the audience. With performances of “O Sole Mio”, “Santa Lucia” and “Funicula Funicula”, the audience was clapping enthusiastically and singing along. After this enjoyable performance, I started chatting with the musical’s manager, Antonio Ferola, and he provided me with great insight into Sorrento’s culture and interesting places to see. I got some great ideas of places to visit in the next few days. We stopped briefly for an ice cream in the famous Pasticceria Gelateria Primavera which has been visited by many celebrities, including Pope Benedict. We enjoyed a late-night ice cream while discussing Sorrento which I was going to explore in greater detail tomorrow, on an electric bicycle.